Member states should pay at least half of their arrears in contributions by the end of the first quarter of the year 2019. Non-payment at the indicated date will lead to the suspension of activities of AfricaRice in the countries concerned. Member states were given a moratorium period not exceeding 2019 for payment of the balance of their arrears. AfricaRice should establish fact sheets on the impact of its interventions in each member country, which is to be used as an advocacy instrument to government authorities. 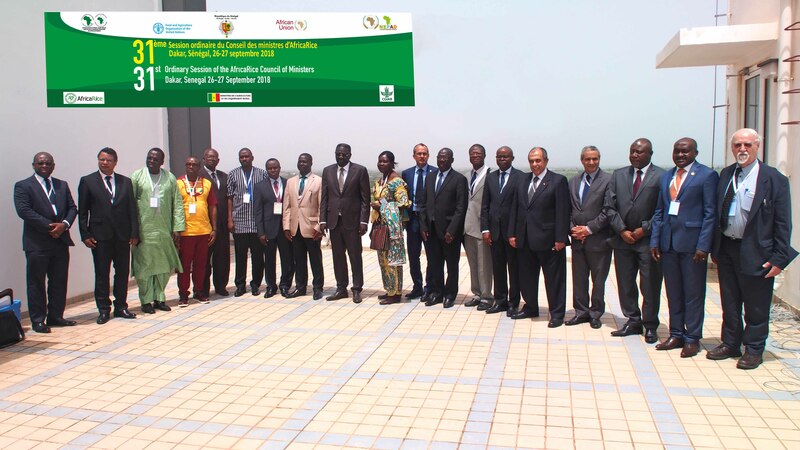 The Chair of the AfricaRice Council of Ministers should address a letter to the System Council and the System Management Board conveying the concerns of member states of AfricaRice about the drastic reduction in financial resources allocated to Centers, and in particular destined for rice research, whereas rice constitutes a strategic crop for Africa. AfricaRice should solicit institutional and financial support from the African Union and the Regional and Sub-Regional Economic Communities (RECs) in Africa, through advocacy actions. AfricaRice should extend the Continental plan for Accelerating Rice Self-Sufficiency in Africa (CIPRISSA) study to other member countries in order to provide strategic evidence-based information that will guide decisions for investments in priority areas of the rice value chain and accelerate the attainment of rice self-sufficiency by 2025 in all member countries of AfricaRice. AfricaRice should further strengthen its internal capacity to mobilize financial resources. AfricaRice should review its organizational texts to better define conditions and modalities for member countries to respect their obligations of payment of financial contributions. AfricaRice should continue to focus on research for development, which is its core mandate. AfricaRice should carry out a study to rationalize its network of stations and to adapt it to the present context. AfricaRice should pursue its work on hybrid rice varieties and high-yielding inbred varieties for different agro-ecosystems in Africa. AfricaRice should develop collaboration with major initiatives on rice in Africa (Coalition for Africa Rice Development (CARD); the Regional Rice Offensive of the Economic community of West African States (ECOWAS), the Competitive African Rice Initiative (CARI), the National Center of Specialization on rice (NCS-Rice) under the West African Agricultural Transformation Program facilitated by the World Bank and CORAF, etc. Member states should facilitate the provision of resources to establish seed reserves at the regional and national levels. The Council ratified the adhesion of Mozambique and accepted to examine and ratify in due course the request of Kenya for adhesion to AfricaRice. The Council accepted the presidency of Egypt for the 32nd Ordinary Session of the Council of Ministers of AfricaRice.